In many Marlborough homes, heating water for household use accounts for about 30 - 40% of the average home energy bill. So it’s no surprise that many families seek ways to lower their energy bills through a more efficient hot water heating system. Harnessing the sun’s energy to heat water is very practical and makes sense on so many levels. It’s free, always available and kind to the environment. And, best of all, a solar water heating system can help you cut your energy bills in half! While there is a higher upfront cost associated with solar hot water systems, the running costs are much lower, making up for your initial investment in about seven – ten years. For homeowners who know they’ll be staying put for a few years, a solar hot water system can be a great investment. Solar hot water systems work by using energy from the sun to heat water. Some systems heat the water using solar panels, while others use specially constructed tubes to heat water. With all solar hot water heating systems, you need a backup booster element in your hot water cylinder to keep the water temperature at or above 60°C to avoid Legionella bacteria growing in your cylinder. This also ensures a steady flow of hot water on cloudy winter days. Solar hot water systems can be installed in both existing homes and new builds. It’s important to get the correctly sized system for your home, which will depend on the size of the household, hot water needs, and the location of your home (for determining sunlight absorption potential). 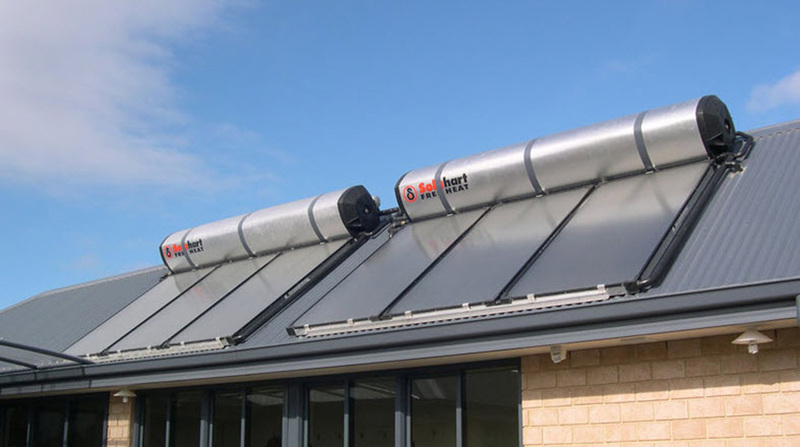 As a general rule of thumb with vacuum tubes (the system we recommend at Climate), a 20-unit solar collector is perfect for heating a 200 litre cylinder (sufficient for small households of 1 to 3 people). A 30-unit collector can heat a 300 litre cylinder (adequate for medium to larger-sized families). Large families and commercial users can efficiently operate with larger cylinders and multiple sets of collectors. Solar water heating is a great solution for many people, but it’s not right for everyone. The higher upfront cost may not work for your budget or your home may not be ideal for collecting sunlight. During the initial consultation, we’ll help you determine if solar hot water heating will work for you. If not, we can share other hot water heating options with you. Need advice on whether solar water heating is the right fit for your home?